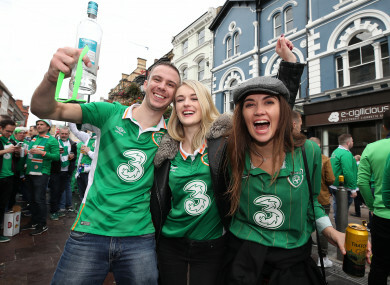 Young Irish fans in Cardiff in October of this year. IRELAND’S BIRTH RATE has been falling each year for the last eight years but the country still has the second-highest fertility rate in Europe. In 2016 there were just under 64,000 live births in this country, down from about 71,000 in 2007. Last year’s live birth figure translates to 13.7 births per 1,000 of the population. The figures were contained in a new publication by the Department of Health called Health in Ireland Key Trends 2017. It pointed out that the decline in birth rates was less about a reduction in fertility rates and more connected to a decline in the number of women of child-bearing age. The birth figures are used to calculate the fertility rate, which is the average number of children a woman could expect to have. Ireland’s fertility rate therefore comes in at 1.82, putting Ireland behind only France in the fertility stakes. The 76 page Department of Health booklet outlines a whole range of stats surrounding Ireland’s health and the health service. As well as the figures surrounding birth, it also looked at mortality figures and showed that life expectancy in Ireland has increased by 2.5 years over the past decade. This has put Ireland’s life expectancy above the EU average but also points to issues Ireland will face with an ageing population. For example, Ireland’s population of people above 65 years has increased by 34.3% since 2008 and is growing by 20,000 people per year. The numbers of people in this age group is expected to almost double in the next 20 years, with the greatest proportional increase in the 85+ age group. This ageing population will put additional demands on the health service, something Minister Simon Harris says he is aware of. “The number of people aged 65 and over will grow from one-fifth to over one-third of the working population over the next two decades which will have implications for how we fund our health services,” the minister said upon publication of the research. In order to be able to provide high-quality services as our population continues to age, we need to have the ability to assess the performance of the health system in a way that ensures that valuable and finite health care resources are used in the most efficient way possible and that people can access high-quality care in a reasonable time. The report also outlined statistics on the survival rates for various diseases. It showed that, while survival rates for cervical, breast, colon and rectal cancer have all improved over the last decade, the survival rates in Ireland remain lower than the EU average in all those cancers except rectal cancer. Email “Irish people are more fertile than almost all of our European peers”. Feedback on “Irish people are more fertile than almost all of our European peers”.